Would anyone have more information (how many are printed), rarity, etc and values on these notes. These are quite common. A quantity of them turned up a few years ago, and they are readily available currently. It is a good way to get an example of the notes in good grade, as the issued £1 note is quite a scarce Type, and is rarely seen in VF or better. The remainders turn up both with and without serial numbers, and there are also partially printed examples. The £5 denomination is not known as an issued note, so the cancelled remainder is the only way to obtain an example of the note. 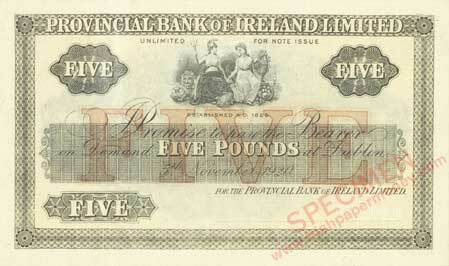 There is also a rare £5 proof dated 1920 recorded, pictured; and a £50 note. Other denominations may also turn up. The £1 notes as issued notes are reasonably common in low grades, though still scarcer than the £1 remainder notes. They are listed in the SCWPM, 16th edition. I have seen them selling on eBay for between £45 and £100 (actual sale rather than just offer price), they tend to not sell if offered at a higher price. There appears to be no difference in value currently between the £1 and £5, though in time the £5 may fetch a higher price. i did pay a bit more than that, but being graded that's what happens I guess. I figured a good few were out there alright. They're nice notes and a great conversation piece also.